The loon (Gavia immer) became Minnesota’s state bird in 1961. 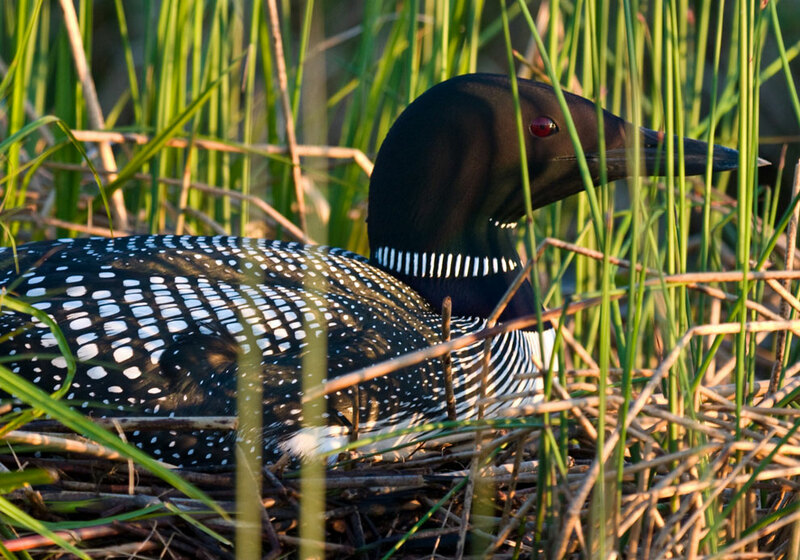 The loon (Gavia immer) became Minnesota’s state bird in 1961. It is known also as the common loon. Loons are large black and white birds with red eyes. They have wingspans up to five feet and body lengths up to three feet. They are clumsy on land because their feet are situated toward the back of their bodies, but they are high-speed flyers and excellent underwater swimmers–they will dive to depths of 90 feet in pursuit of fish to eat. Loons are known for their soliloquy of cries, wails, and yodels; their eerie, echoing calls are a distinctive feature of Minnesota’s northern lakes. Approximately 12,000 of this waterfowl make their summer homes in the state; the one pictured here nests on Larch Lake, near the Gunflint Trail.